These Chrome Soft's are so cheap as they have player pen marks on them. Absolutely nothing to stop you playing a round with them. The Chrome Soft's are all in premium condition. At this price they are up to 45% cheaper than our standard pricing. VERY limited stock. The only golf ball to receive 5 stars for innovation, Performance and Feel in the 2015 Golf Digest Hot List. The Chrome Soft features the all new "SoftFast" core combined with a Tour Urethane Cover. The result is a ball that provides huge spin around the greens while still maintaining great distance for slower swing speed golfers. The core is around a 65 compression, much lower than a Pro V1 or B330 which normally feature 85-95 compression. This allows golfers with lower swing speed to compress the ball like a tour player. These balls have fast become one of the most popular in the game, try them out today. The Chrome Soft bestows all golfers with the powers of added distance and increased control, but it benefits players with moderate swing speeds even more. The product's low compression SoftFast core creates a softer feel off the clubface without a high degree of spin, enabling players with slightly slower swings to hit the ball further off the tee than they ever have before. Higher handicappers will go wild for the extra distance, while lower handicappers will love the Chrome Soft's short game performance. 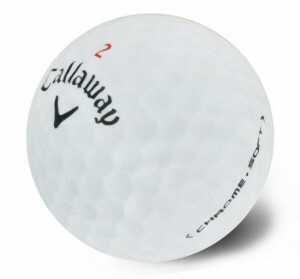 At Lost Golf Balls we take pride in having a massive range of Callaway golf balls such as Callaway Hex Black golf balls, Callaway Warbird Plus golf balls, Callaway Warbird golf balls, Callaway Hx Diablo, Callaway HX Diablo Tour , Callaway Diablo golf balls, Callaway Big Bertha golf balls and Callaway Big Bertha Diablo Golf Balls. If you have any questions about these or other golf balls please feel free to contact us today! very good quality . Prompt delivery . Quick delivery. Quality exceeds expectations. Quick delivery, good product and price. Well done. I will be buying more. Excellent service, prompt delivery. Great way to purchase quality golf balls at a great price! Balls as advertised. Delivered on time. Very happy repeat customer. Got mint condition Chrome Soft balls and they are exactly that. No point buying brand new ones in my opinion. Always fast delivery. Excellent service. Balls as new. Supreme Value On Chrome Soft These Chrome Soft's are so cheap as they have player pen marks on them. Absolutely nothing to stop you playing a round with them. The Chrome Soft's are all in premium condition. At this price they are up to 45% cheaper than our standard pricing. VERY limited stock. Callaway Chrome Soft Golf Balls: A perfect combination of spin and distance The only golf ball to receive 5 stars for innovation, Performance and Feel in the 2015 Golf Digest Hot List. The Chrome Soft features the all new "SoftFast" core combined with a Tour Urethane Cover. The result is a ball that provides huge spin around the greens while still maintaining great distance for slower swing speed golfers. The core is around a 65 compression, much lower than a Pro V1 or B330 which normally feature 85-95 compression. This allows golfers with lower swing speed to compress the ball like a tour player. These balls have fast become one of the most popular in the game, try them out today. Basic Information Of Callaway Chrome Soft Golf Balls: Low Side Spin Off The Tee SoftFast Core HEX Aerodynamics Tour Urethane Cover 3-Piece Construction The Chrome Soft bestows all golfers with the powers of added distance and increased control, but it benefits players with moderate swing speeds even more. The product's low compression SoftFast core creates a softer feel off the clubface without a high degree of spin, enabling players with slightly slower swings to hit the ball further off the tee than they ever have before. Higher handicappers will go wild for the extra distance, while lower handicappers will love the Chrome Soft's short game performance. At Lost Golf Balls we take pride in having a massive range of Callaway golf balls such as Callaway Hex Black golf balls, Callaway Warbird Plus golf balls, Callaway Warbird golf balls, Callaway Hx Diablo, Callaway HX Diablo Tour , Callaway Diablo golf balls, Callaway Big Bertha golf balls and Callaway Big Bertha Diablo Golf Balls. If you have any questions about these or other golf balls please feel free to contact us today!